In Douglas Sirk’s 1956 soaper There’s Always Tomorrow, Fred MacMurray’s perfect family learns the hard way that fathers need attention too. MacMurray plays Los Angeles toy manufacturer Clifford Groves, father of three and married these twenty years to his high school sweetheart, Marion (Joan Bennett, lovely once again after the disaster of Highway Dragnet). As the movie unfolds, we meet a man who is taken utterly for granted by his wife and children. The kids treat him as little more than a cash machine, without pausing to consider where the money actually comes from and what their father has to put up with to earn it, while his wife is so wrapped up in the comings and goings of the kids that she’s often too busy or too tired to spend time alone with her spouse. The Groves seem to be comfortable in their familial rut until Clifford chances into a former employee while at a business meeting in Palm Springs. Barbara Stanwyck plays Norma Vale, once a toy company employee before unrequited love forced her to flee the west coast for Manhattan and a wildly successful career as a fashion designer. She’s been carrying a torch for Clifford ever since, and the pair spend the balance of their time at the desert resort innocently reminiscing. Things go wrong when Clifford’s son Vinnie (Bill Reynolds) spies the pair having a good time and assumes the worst. Before long, the other Groves children are suspicious of their father, who moment by moment seems at risk of tipping for his old flame. So in the end it is left to Stanwyck, one of filmdom’s greatest martyrs, to do the right thing and save the Grove family from certain disaster. It almost goes without saying that There’s Always Tomorrow props up the postwar notion of the perfect, patriarchal family unit, and that the dramatic tension (of this and countless other films just like it) springs from an external threat to the harmony of that unit. And while the outcome here is predictable, the film is interesting in the sense that it makes only the children aware of the peril to their family — the wife and mother carries on blissfully unaware. Certainly one might suggest that Joan Bennett’s Marion couldn’t be that naïve, but the movie makes no overt suggestion that anyone other than Grove children are aware that their father’s eyes are wandering. In this way the picture utilizes the vagaries of the ersatz affair to focus on the various wrong interpretations of the situation the Norma, Clifford, and most importantly, the children themselves. In this way There’s Always Tomorrow is quite successful. In their fourth and final film together, Stanwyck and MacMurray impress — though she has the better role and does a little more with it. 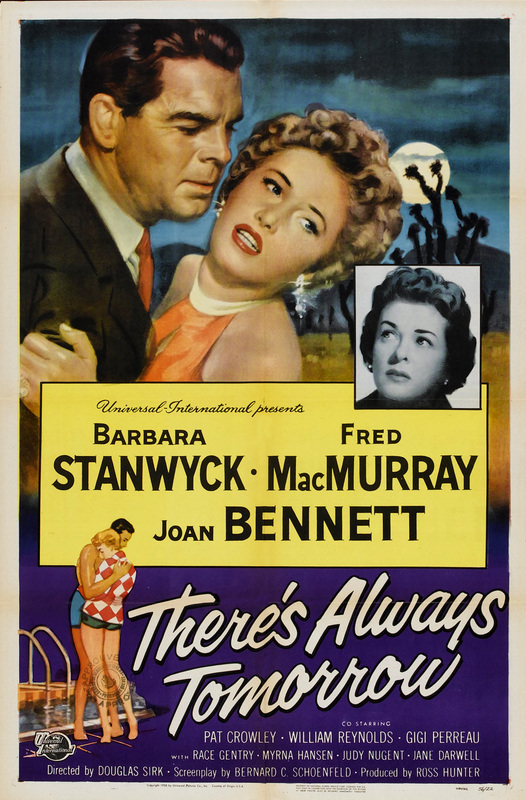 MacMurray’s chief task is to play a robotic family man (there’s a great piece of Sirkian symbolism for this in the film) brought back to human emotion through contact with another woman, while Stanwyck gets to sacrifice love for likely spinsterhood in an effort to save him — in exchange Sirk famously gives her the tears through the rainy window treatment. While this isn’t as soapy and outrageous as some of Sirk’s technicolor melodramas (this one is black and white) it instead favors believable scenarios and underplayed performances. At 84 minutes it is over much too quickly, but it remains a solid, entertaining, and even thoughtful outing from Sirk and company. A note about the poster: Poor Joan, relegated to a black and white tip-in, which seems ironic in that it its placement is indicative of her standing not only in this picture, but in the business as well. In the wake of her 1951 scandal, this seems about as much as she could manage; set apart, looking longingly up at her peers. Availability: widely on DVD, airs on TCM. Just caught up with your post -- this sounds really good. I have the film here, just haven't caught up with it yet. Hope to rectify that soon. Thanks for an interesting rundown on the movie! Thanks Laura - Hope you enjoy it!